The 2019 Mazda 3 debuted at the LA Auto Show this week, proving automakers do still care about enthusiasts, sedans aren’t dead yet, and designers can still make weird, bold cars. But if you thought you could get over the glaring C-pillar on the hatch if maybe, just maybe, a Mazdaspeed version came along, you’re out of luck. Mazda makes the Mazda 3 in a sedan and hatchback model, and both debuted in LA this week with the new Skyactiv-X engine as an option. That’s the one that’s, basically, Mazda’s gasoline engine to prove that gasoline engines aren’t going anywhere anytime soon, promising high efficiency and low emissions with some high-compression and other tech. But don’t expect the extra options to lead anywhere in terms of a Mazdaspeed performance model, like the company has done in the past with the Mazdaspeed Miata, Protegé, 3 and 6. Mazda president and CEO Akira Marumoto told Australian outlet Drive at the LA Auto Show that Mazda’s a small company, so a performance version of the new Mazda 3 is not “a high particular priority” and the company isn’t planning one. When our David Tracy asked Mazda representatives in LA about a Mazdaspeed version of the new 3, we were also told not to expect one. 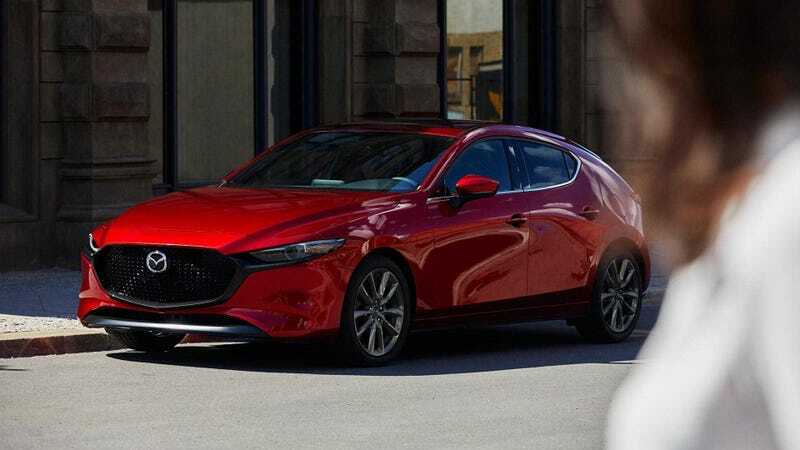 But hey, we were reminded, the company does offer “Signature” versions of the Mazda 6 and CX-5, which, along with other higher trims, both get 2.5-liter, four-cylinder turbocharged engines rated at 250 horsepower. “When asked if that engine fits in the 3, they said it does,” David reported back from the show floor. As for power and fuel-efficiency numbers on the Mazda 3 engines announced at the LA Auto show, there aren’t any yet. Mazda said the new Mazda 3 will come with three versions of its Skyactiv-G engine, with displacements of 1.5, 2.0 and 2.5 liters, a 1.8-liter Skyactiv-D diesel engine, and the new Skyactiv-X that is, essentially, supposed to make us drop to our knees in awe. It’ll also come with the choice between a six-speed manual and six-speed automatic transmission, because choices are good, especially when they involve third pedals. But we won’t get the choice of a Mazdaspeed, according to Mazda, for whatever reasons it has not to make one. Unfounded reasoning goes both ways, though, and we’ll always find reasons not to let our hope for one be fully snuffed out.